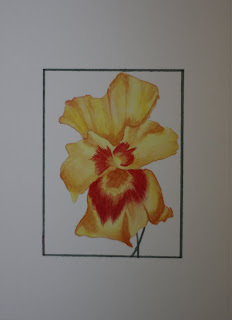 This is my latest painting of a yellow flower painted in watercolor for a series of minature flower paintings that I started this week. The image size is only 3x4" which for me is pretty small and the green border is painted with the same colors used for the stems. The colors are much more vibrant in real life, I am still camera challenged after all this time...or should I say lighting challenged! Each flower in the series will have the same green border painted on and will be matted with a white matt set in a black frame so they can be mixed and matched or displayed on their own.